Stewed Sweet Herbal Chicken Soup (Gà Hầm Thuốc Bắc) is really delicious and healthy. Most herbal chicken soup can be bitter and kids do not like them. This Traditional Vietnamese Food, however, is sweet due to the ingredients used. With a combination of American dried fig, red dates, honey dates, gojiberries, dried longan, pei ji and yuk chuk , you can be assured of a sweet tasting soup filled with goodness. 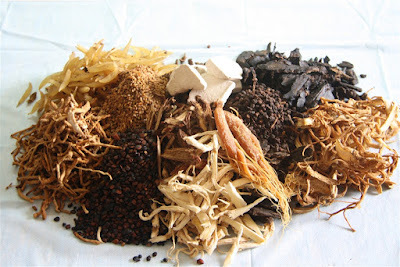 This amount of herbs used in this soup is estimates only and do not come under any special recipe from the Chinese medicine store. (Some ingredients above are mostly from China, so I cannot translate it to English, hope you do not mint it). The herbs used are from top (clockwise) – red dates, dried longan, American dried figs, pei ji, honey dates and yuk chuk. Kei chee is not shown in the picture but you can see them floating on the 1st picture above. Some of them are quite hard to look for. boiling water over it. This will help to remove some unpleasant “smell”. Bring water in double boiler to boil. Place herbs on bottom of a double boiler and place chicken on top of the herbs. Add the 700 ml boiling water and cover lid. Double boil for 3 hours. Add salt to taste before serving. 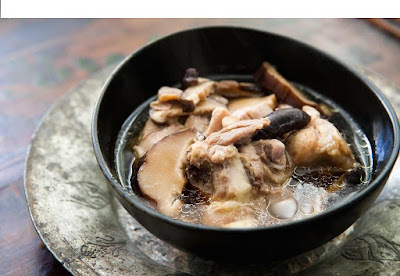 This is only simple of making this Stewed Sweet Herbal Chicken Soup, you could search more information to make perfect dish. If you want the soup to be healthier, you might want to remove the chicken skin prior to cooking. This Stewed Sweet Herbal Chicken Soup is really a healthy food for patient, especially the person who is getting sick. Hope you will come to Vietnam one day early and enjoy it.